QuickBooks Premier Edition 2009, which goes on sale online today and is slated to appear in stores next week, sports numerous useful improvements, including multicurrency support for transactions with foreign vendors and customers. The new edition of the market-leading small-business accounting package also improves multiuser capabilities, offers smarter online banking, and makes it easier for your outside accountant to work with your QuickBooks records. Longtime users will welcome improvements to the dashboard: The company snapshot feature includes more details on your business finances and makes it easier to drill down to examine the details. And new users will benefit from the addition of a panel with context-sensitive links to the QuickBooks Live Community, a user bulletin board--a feature that could help them get answers to many questions. Intuit couldn't have timed its new support for multi-currency any better. Healthier economic conditions overseas will encourage many businesses to sell offshore to foreign customers. 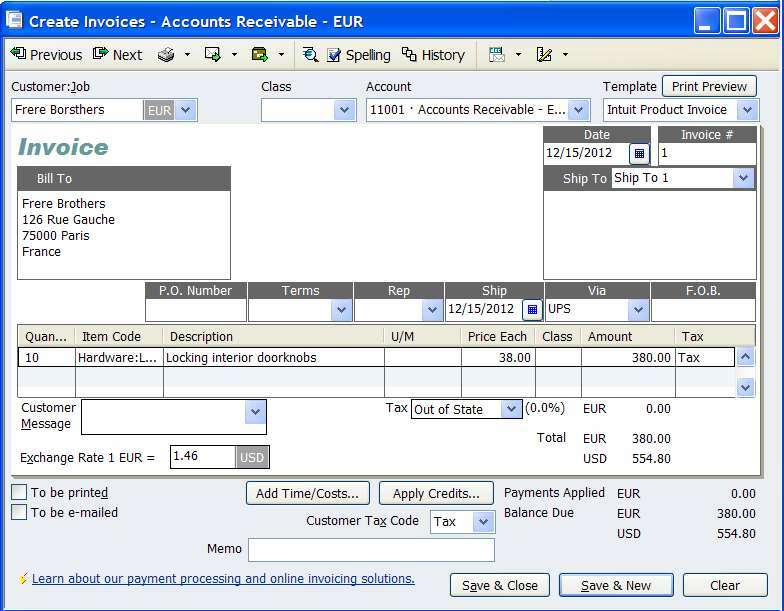 With QuickBooks 2009, you can easily prepare invoices in Euros or other currencies, even if your product costs are maintained in U.S. dollars. QuickBooks lets you download up-to-date currency exchange rates so you can easily prepare invoices in Euros or other currencies, even if your product costs are maintained in U.S. dollars. You can view your outstanding receivables either in U.S. dollars or in the foreign currency. Customer payments can be received by wire transfers using Intuit Payment Services (at extra cost). Intuit says that, at about half of the businesses using QuickBooks, more than one person works with the software. These businesses will appreciate the improved multiuser mode, including data backup and running reports. QuickBooks Messenger lets you text-chat with other users. Some operations must still be performed only in single-user mode. But QuickBooks administrators who need solo access can now send a message to other users and log them out. Banks rarely record transactions the same way you do in your company books. Borrowing from its personal finance application, Quicken, Intuit lets QuickBooks 2009 suggest possible matches when you download transactions from your bank account. You can then establish a rule to rename similar transactions in the future, to save time. Intuit now provides a free Web site for 12 months for each QuickBooks customer. Unfortunately, the plan appears to have been designed by a tight-fisted Ebenezer Scrooge: The freebie is limited to a scant three Web pages, so it's hardly worth your time to set one up. Microsoft Office Live Small Business offers a far more generous bundle of free Web services, including both a custom domain and e-mail accounts. Intuit rolled back last year's $50 price hike, so Premier 2009 costs $400. The improvements make it a good value for new users and a worthwhile upgrade for current customers. A less costly Pro edition ($200) lacks industry-specific financial reports and inventory-tracking tools, but it may appeal to smaller service businesses on a budget.